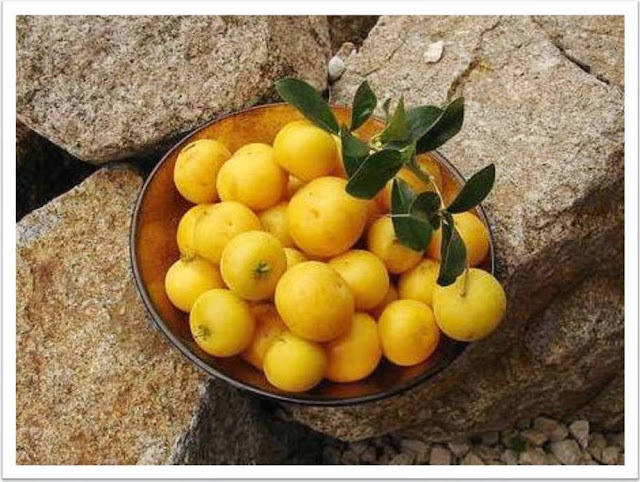 The Kei Apple produces a bountiful crop of roundish, velvety, bright yellow fruits with thick succulent flesh. It was there for the taking by the birds and, what they do not not eat, falls to the ground to ferment, attracting fruit flies and eventually rotting down, returning nutrients to the soil. The tree, Kei-apple, Dovyalis caffra, is well known all over the eastern parts of South Africa, common in open bush and wooded grassland, and often near termite mounds. It belongs to a cosmopolitan family, the Flacourtiaceae, which are all good, fruit-bearing shrubs or trees, very often armed with vicious spines, and its name derives from the Kei River where it grows in abundance as a thick, shiny, spiny shrub up to three metres in height. The branches are armed with straight, robust spines up to 7 cm long. Last year my trees, I have three planted at my wildlife pond, also bore an abundance of fruit for the first time ever and I ascribe this to the fact that we get heavy frost here in Tarlton (South Africa). It has taken almost seven years for my trees to reach just over three meters tall and I was absolutely thrilled to have the fruit. Of course I had to try them but they really are too acidic, with a slight hint of sweetness, to enjoy on a full-time basis. And I'm therefore also not surprised at all that Torti, my Leopard Tortoise, did not touch any that had fallen on the floor. But they look really beautiful displayed in a dish! Some trees may grow to nine metres with a thick crown of green foliage; these large specimens are often less spiny as the tree has put its energy into its bulk, rather than into thorn production. The tree is known by a variety of other names: Dingaan’s apricot, wild apricot, wilde-appelkoos, appelkoosdoring, um-Qokolo (Xhosa and Zulu) amongst others. Although it is indigenous to warmer areas, it will survive mild frost, and long periods of drought. It grows well in poor soils. 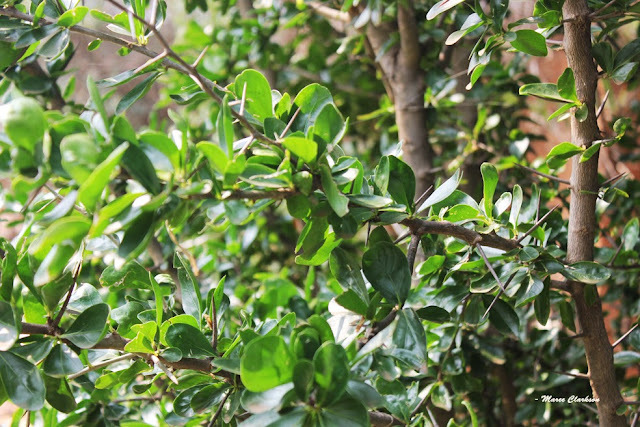 The Kei-apple makes a worthwhile addition to your garden as it serves a multitude of purposes, not least of which as a source of food for humans and animals alike. Fresh, ripe fruits are rich in Vitamin C and pectin and, following the example of the Pedi people who squeeze the juice onto their pap, they would make an excellent addition to a fruit salad and to muesli and yoghurt. Nature seems to know best when to give us the right foods to boost our immune systems in preparation for the onslaught of winter colds and ‘flu. In addition, Egyptian scientists have also reportedly identified 15 different amino acids (the building blocks of proteins) in the fruit. Monkeys and baboons, antelope and birds recognise their health-giving qualities and devour them voraciously in the wild! Most people, however, consider the fruit too acid for eating out-of-hand, even when fully ripe. So, cut the fruits in half, remove the peel and two rings of hairy seeds. Sprinkle with sugar and leave them to sit for a few hours before serving as a dessert, or adding to a fruit salad. The fruits can be cooked, but take only a few minutes of cooking before they turn into a sauce. Thicken this with a little crème fraiche and serve it over ice cream. Kei apples are more usually made into delicious jams and jellies or, when unripe, into pickles. Because of the apples’ high level of acidity, no lemon juice need be added to the jam. Pack the sliced fruit into a jar, stand it in a saucepan of boiling water and let the apples stew for about 15 minutes, or until they start to become tender. Put the apples into a clean, heavy-bottomed pot, add the sugar and the grated lemon zest. Do not add the cinnamon if using ground cinnamon, because it will tend to become viscous when boiled. Hardiness: A subtropical shrub or tree, capable of surviving temperatures to 20F. 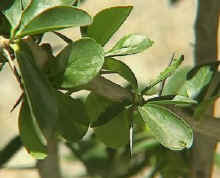 Growing Environment: Kei apple's are both drought- and salt-tolerant and are often used as coastal landscaping shrubs. Plants bear in 4-5 years from seed. Uses: Fruits are often sprinkled with sugar and eaten fresh. They can also be used in a variety of desserts. 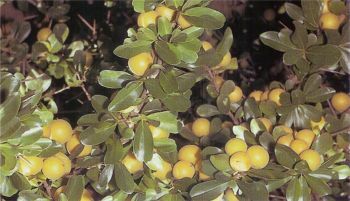 Native Range: Native to the Kei River region of South West Africa, the Kei Apple has adapted to subtropical regions throughout the world and is sometimes planted for ornamental purposes in Florida, California, and Southern Europe.